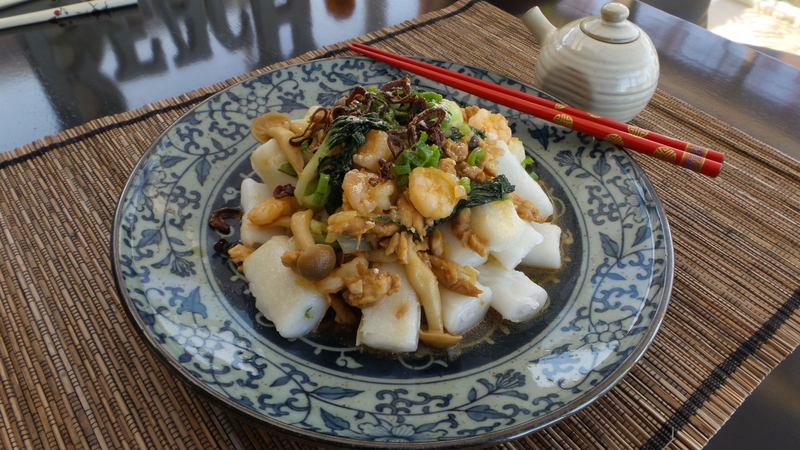 We often had plain rice noodles (猪肠粉) for breakfast when the girls were going to school. Simply pan fry and drizzle with soy sauce, sesame oil, and sesame seeds for a quick and easy fix. I have since turned this to a lunch dish by adding stir fried chicken, shrimp, and vegetables as topping. Another one-wok meal! 1 package rolled rice noodles (猪肠粉), available at Chinese supermarket. Marinade chicken tenders in (A) for at least 10 mins, set aside. 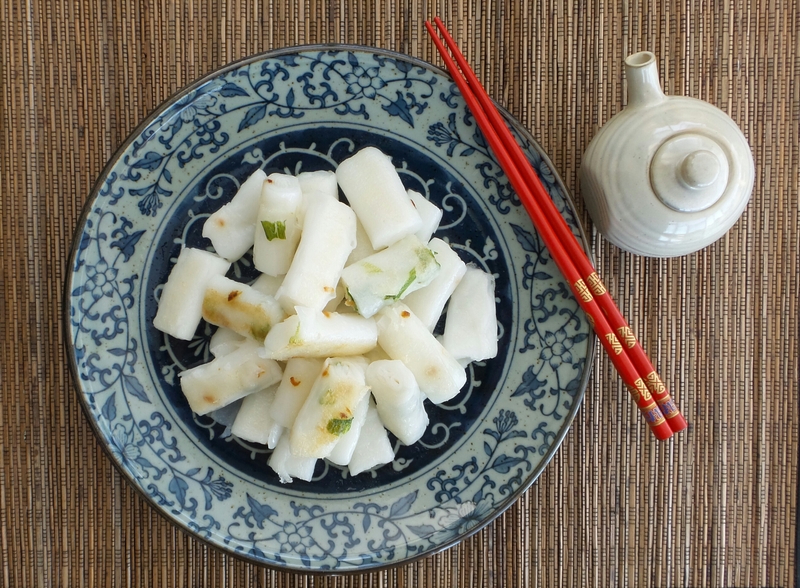 Cut rice noodles into 2 inch pieces. Heat wok and add a little oil to coat the surface evenly. Pan fry rice noodles over medium high heat for 1 minute. Sprinkle 1/8 cup water over the noodles and cover and cook until water has evaporated and the bottom of the noodles turn brown and crispy. Remove from pan and set aside. Add two tablespoon of oil to wok, maintain medium-high heat. Fry shallots and minced garlic until fragrant. Add chicken and stir fry until chicken is almost cooked. 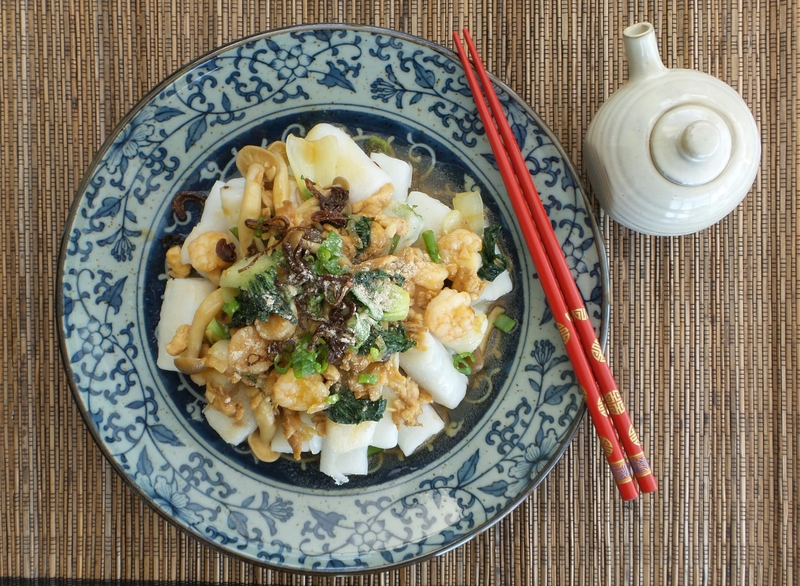 Turn up heat and add shrimp, mushrooms, baby bok choy. Stir fry for another 2 minutes. Add 1/4 cup hot water and 1 Tbsp oyster sauce, continue to stir fry shrimp is cooked and bok choy is wilted. Divide topping over pan fried noodles. Garnish with green onions, celery, fried shallots, and a pinch of white pepper.